Three age- and grade-appropriate forms are included: the Preprimary form for preschool and kindergarten students; the Primary form for students in Grades 1 and 2; and the Intermediate form for students in Grades 3 through 6. The average internal consistency (content sampling) reliability coefficients for all forms exceed .85. 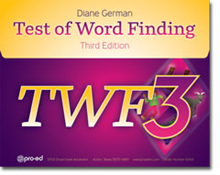 The average test-retest (time sampling) coefficients for the Word Finding Index exceed .80. Correlations of the Word Finding Index with those of other well-known expressive language tests are large or very large in magnitude. Diagnostic accuracy studies indicate that the TWF-3 is able to accurately identify students with word finding difficulties (i.e., sensitivity = .86, specificity = .78, ROC/AUC = .88, cut score = 90).